What If Today Is Your Last Day On Earth? Emotional Pain – What Do I Do? I’m listening to David Lanz’s Christofori’s Dream and watching the most beautiful day unfold. It’s not that today is unusual, nor has anything stellar happened that will make headlines across the world. I am deeply, truly happy. 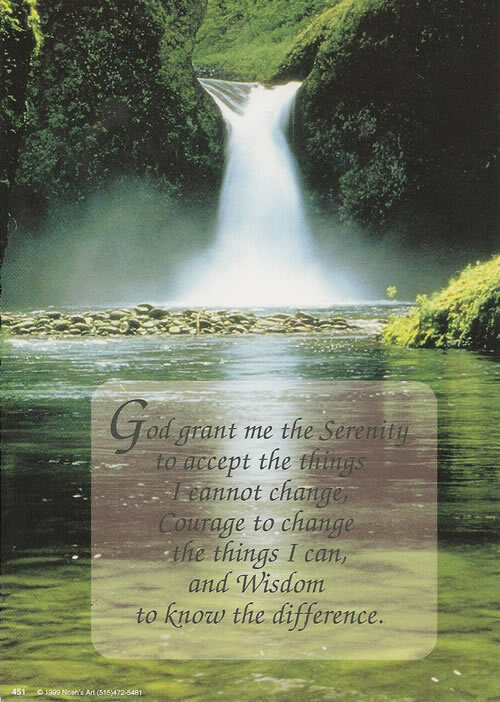 It brings to mind the Serenity Prayer I’ve lived with for so many months now it’s become real to me. The courage to change the things that I can change. That begins inside each of us, the choices that we make, the life that we choose to lead. It’s in teaming up with the spirit inside of you and acknowledging that unique human element that breathes life into life. The things that I can change. My attitude. My love for creation, man included. My hopes and dreams, allowing all of the Divine inspiration out and into the world. The way I greet others, how much I care, and how truly. Grant me the radical love you have for me, for other people. God grant me the wisdom and the courage to see the things that I can change in myself, and to encourage others to want to live a more full, authentic life. Grant me the resourcefulness to be kind, to be encouraging on days when I suffer. Grant me the wisdom to never regret, to never lose hope, to never abstain from faith. The things that I can change in the world around me, grant me the courage and clarity to have a voice, even if it’s shaking. God, give me this moment of serenity to know what cannot be changed. Others actions, addictions, illusions. I can’t be the catalyst of lasting change…that is their responsibility. Teach me to pray and not preach; support and not condemn; love, but not enable. Serenity comes in knowing the difference. You were born in this time and this place for such a purpose, to live, to find joy, to be whole, to serve and be served by those that love you as well. and clean. Later T and I are going to practice second grade stuff and make a new scrapbook page. We’ve read stories and laughed over the three squirrels running through the back yard, fighting to win one of the two ears of corn. It’s not that the day is so unusual, just that God did answer my prayer of Serenity. Jesus said, “my peace I leave with you. Not as the world gives, but as I give.” I think that I’m going to preach on serenity this Sunday as I’m invited to a little country church up by Anderson. Serenity, borne of wisdom on the wings of grace. You Christ followers out there – because you know that Christ petitions for you at the Father’s side every day, how can you be afraid? How can you live less of a life than is possible, steep yourself in compromise, encased in the death of half truth shadows? I think of the word “dulos” in Greek; yes, I know it’s spelled differently here. But in truth, it is all the same. The Christian Apostle Paul called himself a dulos, which to me is a big deal – you see, Paul never met the living Christ. Like you and me, he lived in faith that there is something more to the human soul than just a short span of years on the earth. Paul was the first “by faith only” apostle of the Christ… he lived, gave everything and died for that love. To beleive in something so fully that you’re willing to really LIVE for it. Now there is a challenge. Dying you only do once. Scary as hell, I am sure. But to live a life invested and true…that is a miracle. We’re so busy that we lose what is often the thing that we’re “fighting for.” Love. Life. Serenity. Chaos would have choked out the beauty of the day. It would have negated the sapphire blue of the sky, the light breeze, and the engaging smile of the most beautiful girl in the world. Chaos and negativity, drama and all that goes with it costs us so much….moments like now. Perfect little quiet pieces of heaven. God, grant us the wisdom and the courage to change what I can change, to let go of the things that I cannot, and the grace to know that you are the difference…. Copyright © 2019 Changed For Life. All Rights Reserved.